About a year ago, during my many hours spent online, I found one of the best-kept secrets on MTGS — the Make a Proxy Thread. Those of you who have read my previous articles will recall my mentioning this thread on several occasions. You’re about to find out why. The MaP thread isn’t in the artwork forum. Instead, this gem is hidden away in the Cube forum. Like us, cube players know the drive to have the most aesthetically pleasing stack of cardboard money can buy. Maybe that’s why the thread is located in that section of the forums. Also because they play with Power 9, and Library of Alexandria and such. I was attracted to the thread because of the amazing Photoshop skills on display there. After seeing such fantastic work, there was only one thing to do. I had to get some of these proxies on paper. Sure, I already owned most of the cards, but the proxies were much more beautiful than the real thing. I started out small, with some tokens. I read through page after page, trying to find the best method. I watched countless videos. The cheapest method I could find at the time was the transparency method. It involved blanking foils with acetone and gluing down proxies (printed backward, which was an adventure all on its own) onto transparency sheets. The adhesive spray I used got everywhere. I eventually learned to cover every nearby surface with plastic bags, but not before I had coated my keyboard and mouse in a nice, sticky coat. After much more trial and error, I was left with some pretty cool tokens. I would have cheerfully gone on making proxies this way, except for one tiny problem. The proxies were about three times thicker than a normal card. They destroyed sleeves and you could always cut to them. This could all be remedied if I printed directly onto the card, which was widely considered the best method. Being determined to make the best quality proxies and tokens I could, I saved up for several months and bought a laser printer (inkjet printers won’t work). Before I go any further, I want to take the time to make a few statements. And just in case you were thinking of trying to pass some proxies off as real, they won’t hold up under scrutiny. 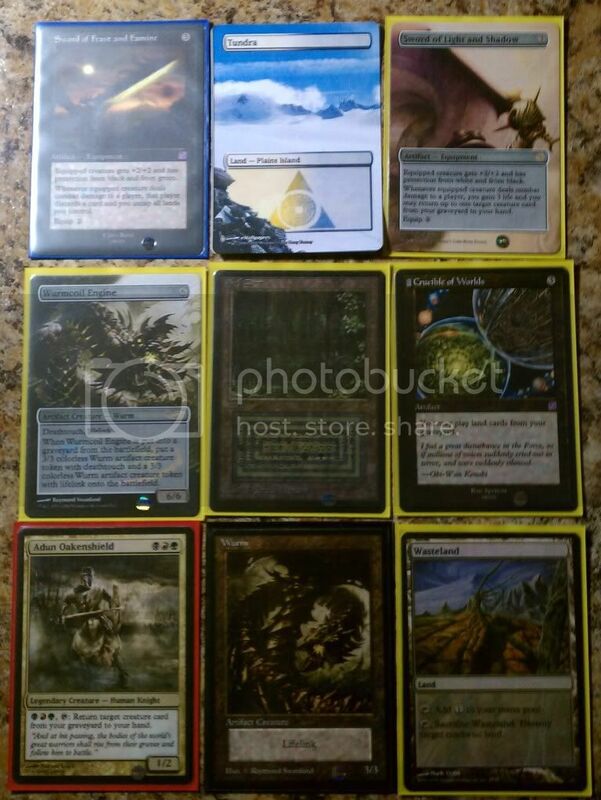 Also, I report people selling proxies on eBay when I’m bored. If you use someone’s art, then credit them. Even if it’s just their online identity, it’s better than nothing. Now that I’ve got that out of the way, it’s on to the technical stuff. If you want to start making your own proxies, there are a few things you need. — A laser printer. I have a Brother HL-3070CW and it works great. Don’t ask me about other printers, though. I just got what the guy at Office Depot recommended. After you have all the supplies, you need a card to actually print. Many of my proxies come from the MaP thread. Since I lack super boss Photoshop skills, I use Magic Set Editor to make the rest of them. I open up a new Word document and insert the image (although you can use whatever program you prefer to print), making sure it has the correct dimensions. (Magic cards are 3.49” x 2.52”) Once that’s done, I save the document and make a test print on cardstock. In order to save my toner, I set my printer to the most horrible settings (toner save, 600dpi, black and white, etc) available for the test print. I always have to write all over the back of the cardstock so that I’ll know which way to put it back into the printer. I highly recommended this. Something along the lines of → THIS WAY DUMBASS–> normally works for me. After that comes out of the printer, you’ll need a blank card to print on. 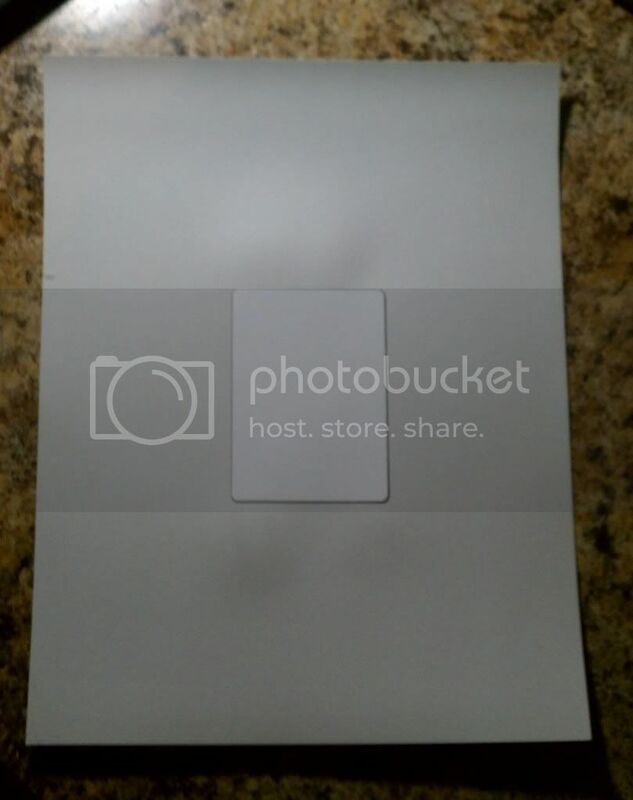 Theoretically, laser printers can print on foils, but mine cannot handle the task, so I use blank white cards. I get them by peeling the foil layer off of junk foils. This YouTube video (made by the guy who runs the MaP thread) explains both de-inking foils and peeling them much better than I could, so I’ll just add that newer foils don’t always peel as well. I often have to take some acetone and scrub off the excess with a cottonball. Foils between Mirrodin and Lorwyn peel the best, but post-Zen foils de-ink the best. Although they are often easy to find, Foil Alara (the special release) do neither well, so avoid them if you can. Once you have the test print and blank card, carefully tape the blank over the area of the test print, using double-sided tape. Use some isopropyl alchol to clean the card right before you put it into the printer (be careful not to use too much alcohol, especially if it contains a high percentage of water, as it will soak through the card). This removes the oil from your fingers and the rest of the acetone, both of which will interfere with printing quality. As soon as the alcohol dries, put the cardstock with the card on it in the printer (this is why the marking on the test print from earlier come in handy). 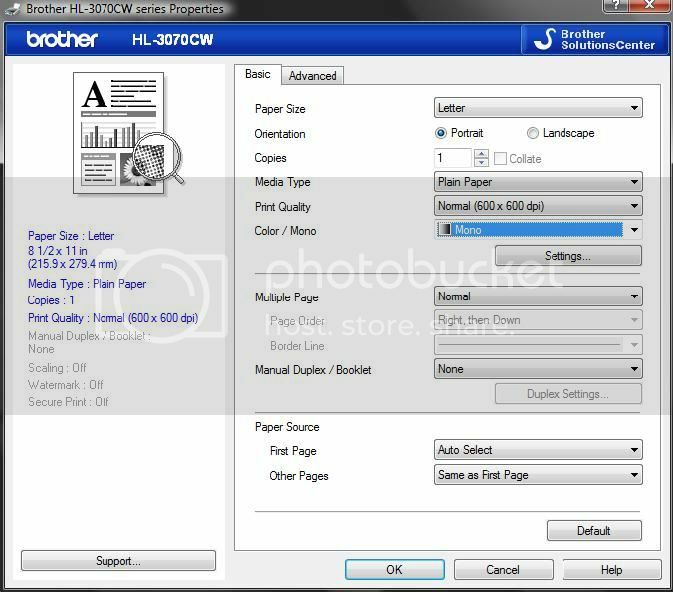 Print the test page again, this time using the highest quality print settings available. Since Magic cards are much thicker than regular paper, make sure you set the printer for a thicker paper. Once the card comes out, peel the card off and use a box cutter (or other blade) to remove the tape from the back. The tape should be good for at least two or three prints. I normally use the same test print as a template until I can’t make out where the edges of the card are supposed to go. To keep using it as a template, all you have to do is insert a new image, re-size it, and drag the new image over the old one. Just make sure that you don’t save the new image, because any misalignment will throw off every other proxy. In addition to my process, here are some resources and tips that should be helpful to anyone who wants to make their own proxies. This is chock full of resources and helpful people. If you post the art you want for a certain card (and ask very nicely), the Photoshop gurus will normally generate a proxy for you. Just don’t say anything about printing directly onto cards, because they’ve forbidden it. This website is normally a good place to start if you’re looking for proxy art. Like I said, just make sure you credit the artist. 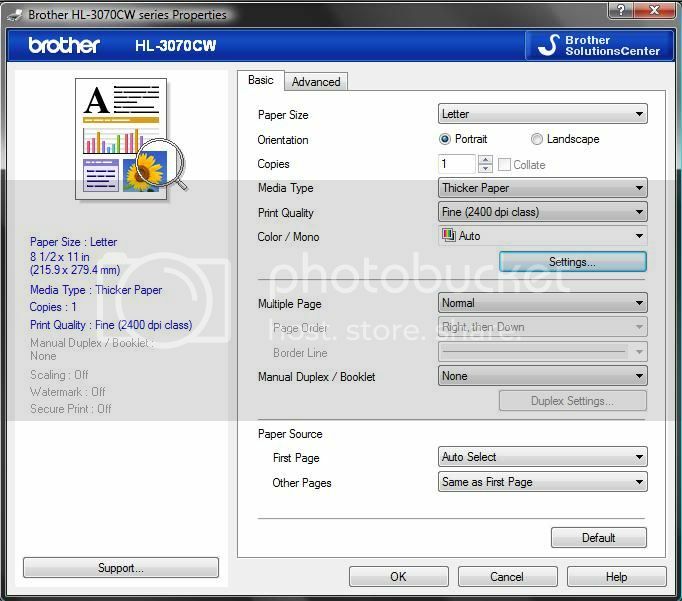 For those of you who don’t want to spring for a laser printer (I don’t blame you), there are other options. The Window Decal Method has replaced the Transparency Method, mostly because window decals don’t require image flipping or adhesive, and are thinner. The Sticker Paper method is basically what it sounds like – you print proxies onto sticker paper and stick them on crap commons. (Bonus points for using Jace!!) Both look pretty good and can be done with inkjets. 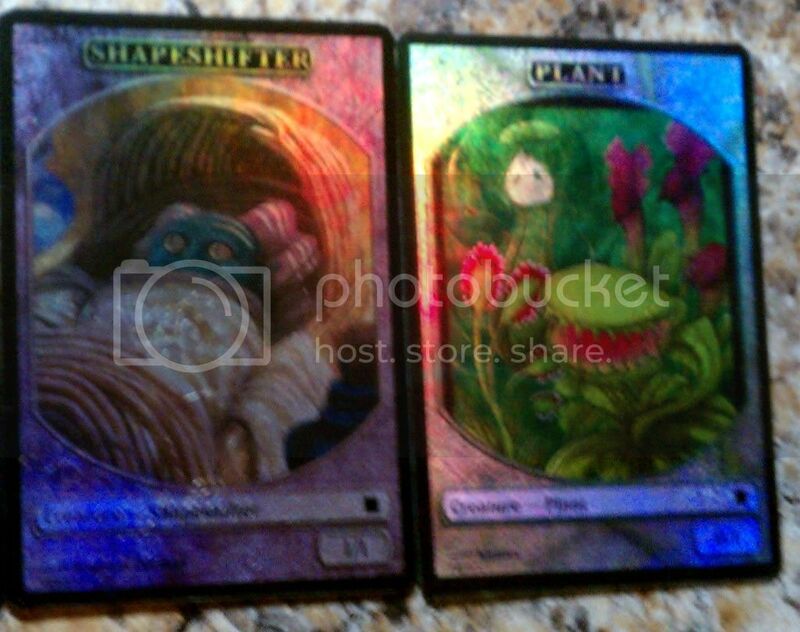 The Window Decal Method even allows for foil proxies. For more in-depth information on either method, see the first page of the MaP thread. Since I lack the Photoshop skills, I asked the helpful people on the MaP thread to generate an oversized proxy for me. I blanked a promo Skullbriar (sorry buddy, it was for the greater good) and made myself an oversized Eight-and-a-Half-Tails. 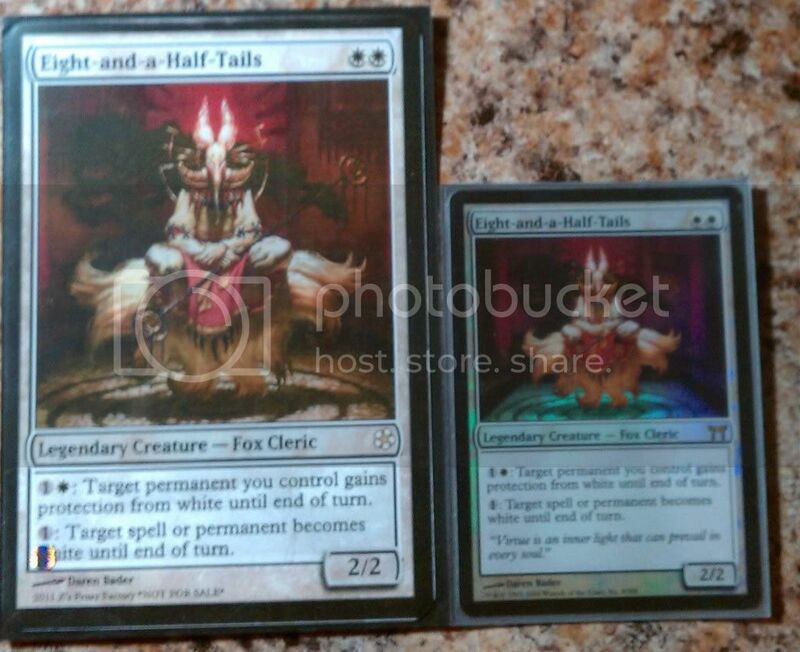 He looks awesome, but the Commander foils are extremely difficult to blank. I ended up tearing off part of the card and had to sand it down. a) Loud cursing is okay. b) Sharpies are your friend. Happy Printing! If you have any problems I’m happy to help.